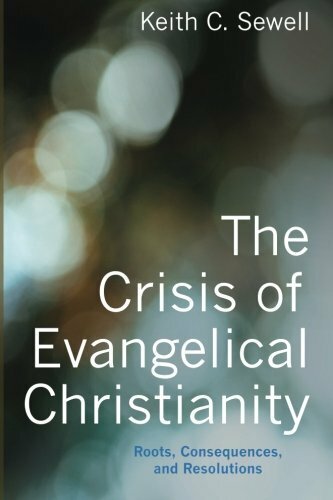 Pryor Thoughts: "The Crisis of Evangelical Christianity"
"The Crisis of Evangelical Christianity"
I got a copy of Keith C. Sewell's book, "The Crisis of Evangelical Christianity: Roots, Consequences, and Resolutions" (Wipf & Stock 2016) at the recommendation of a friend. I had hoped it would be something of an update of Mark Noll's 1994 classic, "The Scandal of the Evangelical Mind." Knowing that Sewell had taught for years at Dordt College, my undergraduate alma mater, I suspected his book would have something of a so-called "Reformational" bent, i.e., it would deploy a simplified version of Herman Dooyeweerd's philosophy as the angle through which to view its subject. Yet I thought that given Sewell's work as an academic historian on the roots of World War I and on historiography, I could expect something equally insightful on this more popular topic. I was disappointed. Perhaps my first inkling of the inadequacy of Sewell's book should have been the absence of interaction with Noll's book. While "The Scandal of the Evangelical Mind" appears in Sewell's extensive bibliography, neither of the text's references to Noll took up the incisive groundwork Noll laid two decades ago. The second deficiency in Sewell's account is his uncritical belief that the work of Herman Dooyeweerd somehow represents a break (and turn for the very much better) in the relationship between Dooyeweerd's philosophical speculations and all previous Christian thought. In other words, before Dooyeweerd all was synthesis (= bad) (Platonic. Aristotelian, Enlightenment, you name it) but with the 20th-century Dutchman all became biblically-directed and thus good. Sewell would have benefited from considering the privately published dissertation of R.D. Henderson, "Illuminating Law: The Construction of Herman Dooyeweerd's Philosophy" in which Henderson establishes to my satisfaction that Dooyeweerd's philosophy finds its origins and structure in a particular strand of neo-Kantianism. A synthesis tu quoque, if you will. Finally, Sewell's book is full of conclusions for which he apparently feels little need of demonstration. Sewell's opinions, taken largely from Dooyeweerd and his epigonies, must be accepted ipse dixit. His off-handed dismissals of nearly 2000 years of Western Christian reflections on the enduring questions of the structures of human life and thinking about life in a fallen world amazed me. It is certainly the case that the history of American Evangelicalism, as Noll has demonstrated, has left contemporary Evangelicals with little grist for the intellectual mill. And it is entirely possible that strands from Reformational thought might prove helpful for contemporary Evangelicals but I have little hope that this book will do much to serve that end. So much for a review. This is not a review. Pity. It is rather, as you admit, a public confirmation, a tweet if you will, of your scepticism of a strong trend from your own alma mater, of your own disappointment. Professor Pryor, you don't seem to understand that this book, written mid-stream as it were, is not trying to put forward a series of "Dooyeweerdian panaceas" (tweets) to an exclusively American evangelical problem. The canvas is not centred on the US even if evangelicalism is very much Americanised protestantism. (see Max Weber's Vorbemerkung to his sociology of religion first paragraph). Sewell my friend, from long-before his Dordt days, is actually wanting to encourage evangelicals, including those he met and respects at Dordt College, to study their own religion historically. Let me give you an example of misunderstanding of the book's intention sometimes: I don't like the fashion of back cover blurbs (an early form of tweet IMHO) but I was persuaded to write a 200 word commendation of this book that included the phrase: "Don't just do something, sit there!" A first print run used my commendation but got it all wrong by reducing it to my allegedly saying that this book tells the reader to "Don't just sit there, do something!" In fact my commendation suggested that the book is a challenge to such activism. It is an historical analysis of a way of life, not just of a way of thinking, nor was it intended as an update of Noll's "Scandal". You might also ask Roger Henderson what he thinks of Keith's book.